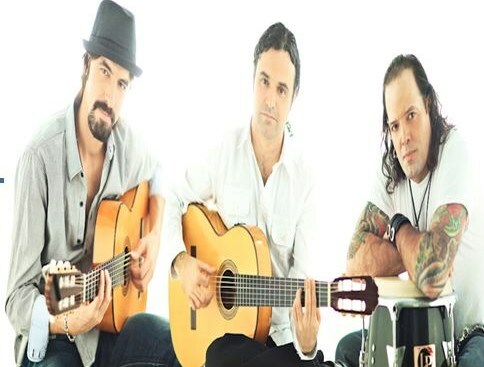 "Experience the sounds of Spain with a spicy fusion of Spanish Guitars and Latin Rhythms.."
Based in Los Angeles area, Calé's sound can best be described as a cross-section of different styles of traditional Rumba/Gypsy Flamenco and Classical Guitarists from Spain, mixed with the finest Latin Styles, World Music ,Latin Jazz and South American Rhythms. Calé has released their first album - Vente Conmigo, where you can find modern rumba patterns as well as traditional flamenco palos such as tangos or tarantas. 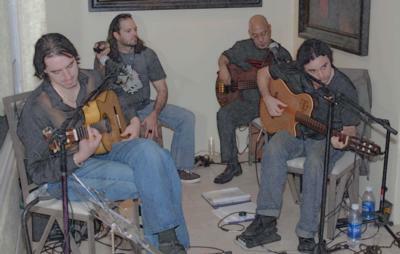 Calé performs their own music in addition to other well-known flamenco and rumba songs, and delivers them to you with their amazing fire and passion, creating a unique sound that appeals to audiences of diverse cultural backgrounds. Calé performs as single guitarist,duo,trio,four or five piece band including dancers, depending on the type of the event or situation. I hired Jose and Victor to play at my Dad's small 91st Bday party. It was a very small group of us, around 10 people and I wanted it to be intimate. They were absolutely amazing!! I really can't say enough good about them. So professional, nice and amazing musicians. You can really tell they love what they do! My Dad was so happy I think he cried. My whole family was so impressed and i'm just so thankful to them for making it magical. I would absolutely hire them again I just need to throw another party!!! Thank you Cale! Absolutely AMAZING! Received rave reviews from event attendees. Looking forward to seeing them at other venues. Amazing musicians. They can take a song from almost any genre and give it a flamenco-rumba twist. Cale was fantastic! Very talented and super friendly everyone at my wedding in Palm Springs loved them! Highly recommend booking these guys. They can literally play anything you ask them! Thank you Cale for providing great music at my wedding! Cale was amazing !! Totally what we wanted for our holiday party. The mode was amazing and all of our guest loved it. I would definitely recommend to all my friends. Excellent ! We love Cale! The evening was beautiful and the music was absolutely magical! Thanks Mark, hope to work for you again! Cale played the processional and recessional for our wedding ceremony, as well as through the cocktail hour. They were incredible! Having the song you walk down the aisle to sound perfect? I could not be more grateful. Victor was very patient as we picked our music and helped us pick our recessional song. Our guests also loved them and were impressed. One mentioned that they thought they music was recorded before realizing it was live. Highly recommend! Please note Cale will also travel to Alhambra, Bell Gardens, Glendale, Huntington Park, Maywood, Monterey Park, Bell, Hollywood, Pasadena, South Pasadena, Montebello, South Gate, Burbank, Beverly Hills, Inglewood, Rosemead, San Gabriel, San Marino, Culver City, Downey, El Monte, Lynwood, Pico Rivera, Toluca Lake, Universal City, Willowbrook, Compton, La Canada, Montrose, North Hollywood.